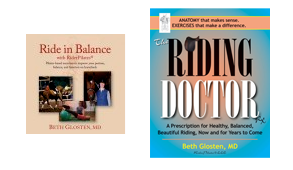 After leaving horses behind for many years to pursue her medical career, Dr. Beth Glosten decided it was time to ride again only to discover that, as a middle-aged woman, she struggled with tension, awkwardness, and an aching back. Dr. Glosten’s own frustration with riding prompted her to apply her clinical research skills to figure out what it would take to not only create the harmonious picture of horse and rider moving together, but also feel good while doing it. 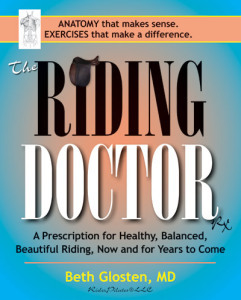 In this book, Dr. Glosten shows others how best to improve their posture and position in order to prevent unnecessary physical degeneration, ensuring they can ride, and ride well, for many years to come. Readers will find basic rider anatomy that is easy to understand, as well as over 50 step-by-step exercises geared toward developing riding skills. Plus, Dr. Glosten has developed a systematic “Rider Checklist” to help you keep track of your position and function in the saddle. Throughout, case studies share rider stories that illustrate the kinds of physical challenges experienced in the saddle in midlife, and how they can be met with proactive, pain-free solutions. The result is a remarkably valuable book. Purchase this book at the publishers website for $29.95.